Working with key signatures is not nearly as difficult as most people will lead you to believe. Here is our simple guide and working method. 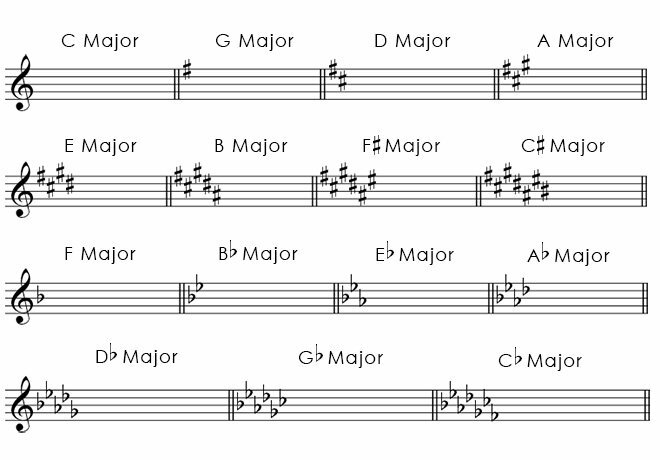 Make sure you know how to build a major scale before continuing! Now you understand how to build a major scale you will see why you need to sharpen or flatten some notes. Put simply, if you start on the note C# then all the notes will need to be sharpened in order to form the pattern of Tones and Semitones that form a major scale. Sharps and flats occur in a specific order in key signatures. The historical reason for this is a thing called the cycle of fifths. We won’t go into that now. You never repeat a letter! If you write G and G# consistently throughout a piece of music it gets really confusing. So instead you’d call the G …. well … G, and G# would be called Ab (it puts you at the same fret either way, but this way avoids confusion). Father Christmas Gave David An Electric Blanket.